Be1 is the ideal choice when you have to make an auto start module for a gasoline generator. It interfaces with the Flywheel generator in a way to provide a proper crank termination (see  connected to terminal '15' & '16'). You have two possibilities to stop the gasoline engine: STOP SOLENOID or FUEL SOLENOID. A STOP SOLENOID output is provided to energize the relay  connected to output '4'. This output energizes when you want to stop the engine. The contact of the relay will close to ground the BI (ignition) terminal on the spark generator. You can easily find this terminal because it is normally connected to the STOP switch on the body of the gasoline generator. In other words, the spark-plug will no longer work; the engine will stop. You can adjust the time for STOP SOLENOID. 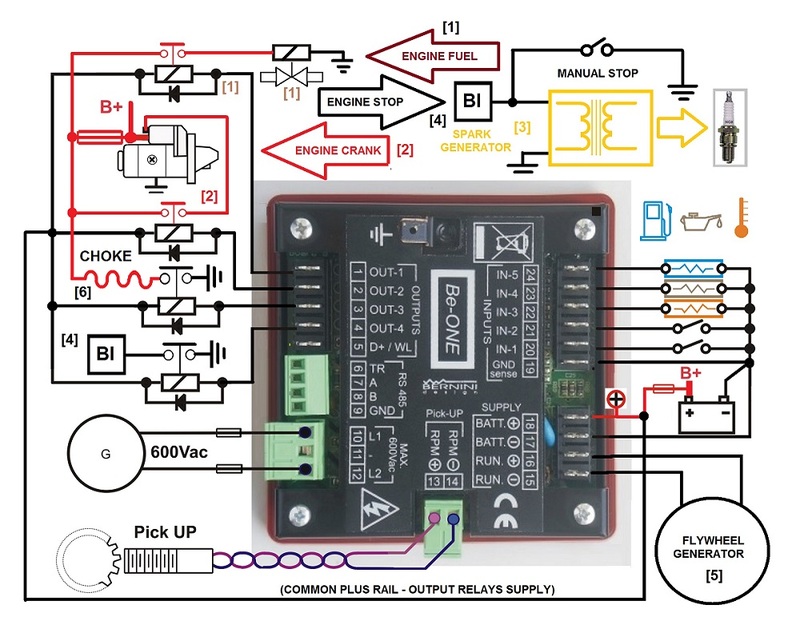 If you feel more comfortable using a FUEL SOLENOID, you can connect a relay to output . The engine can run only when the FUEL SOLENOID output is active. We can say that this is an 'ENERGIZED TO RUN' output. The best solution is to use both: STOP SOLENOID & FUEL SOLENOID. The start circuit it is quite similar to a diesel engine. You are required to connect the pilot driver to the output . About crank termination, if you are not able to connect the flywheel generator do not worry about it. The Be1 has adjustable settings to terminate the crank from the Voltage & Frequency of the GENERATOR (see OEM manual). You can also connect a pickup to get an accurate reading of the rotational speed. Also in this case do not worry about it. Be1 is able to calculate the RPM from the alternator frequency. You have only to set up the number of poles of the alternator. Connection of sensors, analog or digital, is indicated in the wiring diagram as well. You can observe the connection of the auxiliary relay  to drive the CHOKE. This is a mandatory piece of equipment when you require to start a cold engine. In the Installation manual, you will find the recommended settings for GASOLINE ENGINE CHOKE. When you need a remote control, you can connect a remote switch to start and stop the generator. One other option is to connect the RS485 serial interface. In this case you can connect a computer as far as 1000 meters away.